Okay, this first render was done with an actual studio scene, and the second one was done with an environment sphere using a panoramic texture based on that studio scene. 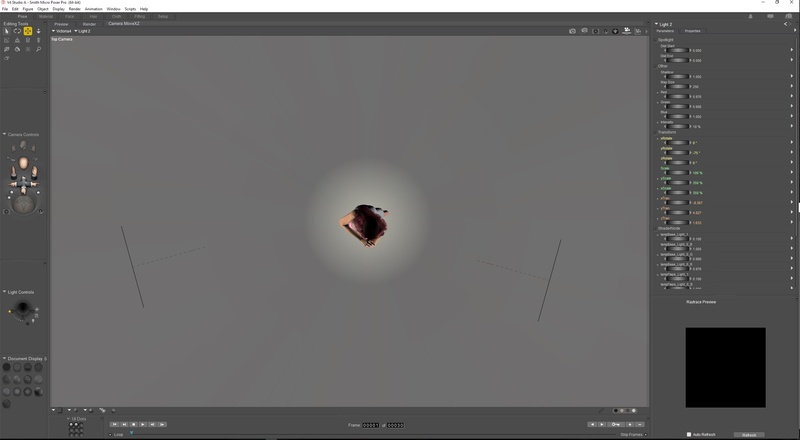 The figure, render settings, and light arrangement is the same. Clearly, I need a physical backdrop prop as a shadow catcher, and I'll soon create a higher-resolution panorama for the sphere, but at least for testing purposes, it worked well. As Ghostship predicted, the second version does look slightly smoother. The second render took about half as long as the second one, though I suspect that most or all of the difference lies in the backdrop, since the character herself didn't seem to render much if at all faster. In a closer-up portrait, where the character takes up a greater proportion of the image relative to the background, the speed advantage would probably decrease noticeably. Has anyone tested this already? @glossaphile another observation: Studio lighting does not produce hard shadows. In a real photo studio there would be giant soft light boxes for lighting. That is what your area lights are for. @Deecey Are you reading my mind Deecey? I was just about to ask the same question. I even like the hair as well. @ghostship Actually, all three of my lights are already area lights, with one softbox fill light. @Deecey No this is a photograph that I downloaded off the internet. @glossaphile Ok can you post up an image of your light setup in a preview? Something is drastically wrong with your lights and I just have not said anything yet about it till now. My guess is they are too small or too close to your figure. @ghostship Do you mean "drastically wrong" as in unrealistic and clearly CGI or as in technically realistic but unlikely for a professional photo shoot? Please keep in mind that I'm not necessarily aiming for something as softly lit as your renders tend to be. My primary goal is to come as close as possible to something that could pass for a photo, even if a poorly or starkly lit one. Heck, if I could render something that looked convincingly like a spontaneous picture taken by a family on vacation, I'd be happy. Once I've clearly accomplished that, then I might turn my focus onto more closely emulating professional light setups. In any case, here's the arrangement. The smallest light is 50% of default size, made to fit the 3D light fixture prop to which I'd originally parented it. Ohhhhh! You know, I should've realized that since the SuperFly Render tag is missing. @glossaphile Yes the "MiniMe" light that you are using as your main light is causing the harsh shadow and probably a source of noise. The smaller the lights the harder it is for the samples to find their way to that light source. You claim that you are not aiming for a "photo studio" look yet you have 3 point lighting? If I was going for a photo-flash look I would remove all the lights and use one light pointed directly from the camera to the model's face. If it was interior lighting as in a room with a couple of table lamps then I would only use an HDRI on the skydome. Bottom line is that your light setup is not flattering to the model. @jura11 Looks fantastic but I'd ditch the hair textures with burned in highlights. It's the main thing that is killing that render. So purely on timings @bagginsbill's is quite a bit slower for the reasons we've already discussed. Is it worth the extra? If I were doing a portrait then I would say yes. I don't think I would ever use the base textures. at least not in superfly. If it were a full body shot I probably would use @ghostship's (for the colour map, I rendered just the diffuse of @bagginsbill's shader on to a large square using white as the colour and rendered at 4096x4096 with a front camera saved that and coloured it with the same colour chip I used in @bagginsbill's to try and get as close a comparison as I could. For the relatively small increase in time the result, in my opinion, is definitely worth it for portraits. Thanks for the input, Amethyst! Ghostship, I use three-point lighting to a great extent because I think it's useful as a generic and neutral setup, especially for testing and honing face morphs. Anyway, I experimented with some softer lighting, and this is the result. For this render, all lights were at least 3x default size (and that's being conservative). This was also rendered with 8 pixel samples overall and both kinds of caustics turned on. Back to the topic at hand, I'm off to do a bit more tinkering with render settings.